Used equipment is equipment typically taken-in from commercial outlets. The products are typically sold with significant discounts, but come with a limited parts and labor warranty. Some products may also be sold as is. Warranties do not cover cosmetics and noises. *Product is being sold “as is”. Some visual imperfections may be apparent. 3 Machines in 1 ! The BRT is equivalent to three machines in one. 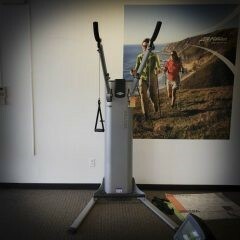 It’s a pull up / dip tower, a body resistance fuctional trainer and a complete stretching station all rolled into one! Body ResiStability™ strength training involves using many muscles in dynamic and coordinated movements against the weight of your own suspended body. 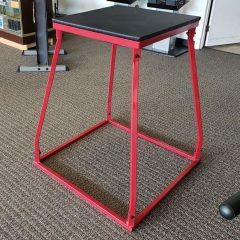 By varying the position and angle of the body relative to gravity, Body ResiStability™ multiplies exercise variety and allows the user to change the resistance level. Traditional “against gravity” exercises have long had their roles in training. Think push-ups, pull-ups, sit ups, even stair climbing. Body ResiStability™ takes such exercises one giant step further by making the user provide the stability, in the same way that a gymnast stabilizes the rings. Stretching is a key component of overall fitness and health and is important for all ages. Enhanced flexibility improves sports performance, quality of life and delays many of the symptoms associated with aging. Besides simply feeling good, the benefits of stretching include increased range of motion, decreased risk of injury, and improved blood circulation, energy level, and posture. The BRT is designed to conveniently and effectively facilitate the stretching your body requires.